President Alison Byerly sent the following email this afternoon. We reach the end of this academic year at a pivotal moment in the history of the College, as the steps we are taking now will define Lafayette for a generation or more. Our move toward “need-blind” admissions, our first year of growing the student body and faculty, and our embarking on the single largest capital project in the College’s history will help secure Lafayette’s place as one of American’s finest undergraduate colleges. I write to update you on the year’s accomplishments and challenges as well as on our progress toward these important goals. On campus, we are still basking in the glow of a joyful Commencement at which 590 students received their diplomas and sang the Alma Mater “…in front of old Pardee.” Commencement speaker Ron Chernow, author of the biography on which the hit musical Hamilton is based, delighted the audience when he ended his address by rapping the entire opening number of the show. We also heard a stirring talk by Valerie Melson ’17, winner of this year’s Pepper Prize. As the senior “who most nearly represents the Lafayette ideal,” Valerie had the honor of presenting the sword of the Marquis de Lafayette to her classmates, a tradition now in its fourth year. A neuroscience major and Posse Scholar from Maryland, Valerie will conduct research on HIV through a grant from the National Institutes of Health before attending medical school in 2018. Equally impressive are the other Class of 2017 graduates, who captured many national honors and awards. Lafayette grads won four Fulbright English Teaching Assistantships, three National Science Foundation Graduate Research Fellowships, two Critical Language Scholarships, two Goldwater Scholarships, one Amgen Scholarship, a Schwartzman Scholarship, and our first Erasmus Mundus Scholarship. The Class of 2017 has had great success in career outcomes as well. Graduates will be starting work at firms and organizations as diverse as: NASA, Turner Construction, Intel, NIH, Oracle, NBC, Barclays, Lockheed Martin, Edelman, Morgan Stanley, and Teach for America. They also will be pursuing medical school, law school, and graduate education in fields like biomedical engineering, neuroscience, computer engineering, and statistics in Ph.D. programs that include Cornell, Columbia, UC Santa Cruz, and the University of Michigan. Career outcomes continue to be one of Lafayette’s strengths relative to our peers. In the Class of 2016, within six months after graduation, 70 percent were employed full time, 18 percent were attending graduate or professional school, 9 percent were pursuing travel, working in unpaid internships, or applying to grad school, and 3 percent were seeking employment. This fall, we will welcome a record 17 new tenure-track faculty hires across all disciplines. Under our new strategic hiring initiative, some of these appointments will increase the number of women in STEM fields and the number of faculty from underrepresented populations. They will join a faculty of great distinction. During the past year, Professor Olga Anna Duhl was named a Chevalier of the Ordre des Palmes Académiques, a knighthood of France conferred on academics and teachers. National Science Foundation research grants were awarded to Professors Mary Roth and Laurie Caslake for work on biofilms to reduce permeability in sand, and to Professors Lindsay Soh, Melissa Galloway, and Steven Mylon to purchase a liquid/supercritical fluid chromatography mass spectrometer. Nearly 20 books written or edited by our faculty, in fields including history, literature, anthropology, sociology, psychology and politics, were published by some top university presses, in addition to hundreds of peer-reviewed journal articles and book chapters, and performances and exhibits by our faculty in the performing and creative arts. This was a year of extraordinary accomplishment for the College as a whole. We celebrated Engineering’s 150th Anniversary as well as the completion of the Williams Arts Campus within four weeks of each other last fall, a sign of the distinctive breadth of our liberal arts and engineering curriculum, which few colleges can match. We broke ground — literally, with explosives! — on the Rockwell Integrated Sciences Center, a cutting-edge academic facility whose name honors the generosity of S. Kent Rockwell ’66. We had a second record year of fundraising in the $400 million Live Connected, Lead Change capital campaign, adding $51 million that bring us to $360 million at the end of this fiscal year. An exhibit in New York City on “Lafayette and the Antislavery Movement” featuring items from the College’s archives received a glowing review inThe New Yorker. We held a two-day symposium featuring some of the country’s top Shakespeare scholars, watched Theater and Classics students collaborate in a production of Metamorphoses in the brand new Weiss Theater in William C. Buck Hall, and saw a student-athlete named to the U.S. National Field Hockey Team. The year also presented many challenges. Sadly, we faced unprecedented losses in our community with the deaths of four students between last August and this May: Sarah Bramley ’19, Joey Towers ’18, Amanda Miner ’18, and Joe Kirkpatrick ’19. Each of these losses was deeply felt by individual students, faculty, and staff, and collectively mourned by the community. In the midst of our pain, it was comforting to see the outpouring of love and support offered to the grieving families of these students, and to recognize that these losses brought us closer as a community. As a community, we also engaged in some difficult discussions. On campus, a tenure case raised questions about the roles of the faculty, President, and Board within our shared governance system. An ad hoc committee of faculty, administrators, and trustees recommended some clarifications to the tenure process that were adopted in May by the Faculty and by the Board of Trustees. We also were not immune from the political tensions felt across the country as a whole. In a year that saw turmoil on many college campuses, I am extremely proud of the way in which the Lafayette community handled the inevitable—and valuable—divergence of views across a community that includes thousands of students, faculty, staff, trustees, alumni, parents, and friends worldwide. I have been asked if we had unruly protests, or cancellations of invitations to speak. We did not. We did have intense feelings, difficult conversations, controversial events, and many thoughtful written expressions of views on all sides. In my own public statements, I stressed general community principles of inclusivity, respect, and open dialogue. The wide range of expressions on campus included statements against racism passed out by protesting students at the Homecoming game; a letter expressing concerns about the impact of the presidential election written by a group of individual faculty and sent to The Lafayette; a memo to the administration from a coalition of student organizations outlining “Diversity and Transformation Concerns of Marginalized Students”; and a report from an ad hoc committee appointed by Student Government exploring concerns about the ability of conservative voices to be heard on campus. These statements catalyzed valuable conversations, and I am particularly proud of the leadership role taken by students in looking for constructive opportunities to engage each other on these issues. We have also seen a range of commentary on social media, and received communications from alumni expressing in some cases support for campus efforts to address the challenges of the current climate, and in other cases concern that students might find themselves subject to one-sided political pressures. I believe that these varied statements are proof that open dialogue is alive and well at Lafayette, and that we are able to negotiate our differences with civility and reason. Amidst all of these accomplishments and challenges, this was the launch year of our initiative for Affordability and Distinction through Growth. Under this initiative, the College is moving toward being able to admit students regardless of their ability to pay, while growing the size of the study body and faculty to enhance our already strong student-faculty interaction and our distinctive integration of disciplines. Support from the entire community got us off to a great start this year. A total of $11.7 million in commitments for need-based financial aid from the Board of Trustees provided the base for launching the President’s Challenge for Financial Aid on Founder’s Day, March 9, when we raised $1.2 million from 1,132 donors in one day. From a record applicant pool of 8,400, we have just admitted the largest incoming class in the College’s history, an academically strong as well as diverse group of students from 37 states and 42 countries. We were successful in obtaining approval from the city of Easton for zoning changes that will allow us to build the first set of mixed-use residence halls on McCartney Street to accommodate our student growth. We were also able to free up additional space on campus by moving 65 employees into “Lafayette Downtown”— beautiful offices on Easton’s Centre Square. Our plan to both grow and diversify the student body brings with it the responsibility of ensuring that all of our students have access to the support they need to be successful at Lafayette and beyond. With this in mind, I appointed a Student Support Task Force in the spring of 2016 which recently submitted recommendations for improving the support we offer all portions of the student body. You can view on the web a summary of some key recommendations. We will begin to explore these over the summer and seek community input in the fall. A primary source of support for all students is Connected Communities, the program we launched two years ago to provide a smooth transition into college life and help students build affinity with their class year and with the College. Entering students create bonds of friendship within one of five Commons and participate in learning modules that include topics such as financial literacy, well-being, and sustainability. Later, they can take advantage of other residential options such as living-learning communities and fraternities and sororities, as well as class experiences that span all four years at the College. Two additional fraternities are currently engaged in a process of recognition by the College which, if successful, will bring the total number of fraternities to six. We are very pleased that across all class years, incidents of alcohol abuse or hospitalizations are down substantially from three years ago, and a recent survey confirms that we have dramatically decreased the highest-risk alcohol use by our students. This is just one result of an increased emphasis on community responsibility. Finally, recognizing that our goal of increased national distinction should include distinction in Division I athletic success, I appointed an Athletics Review Steering Committee in December to review our athletics program and identify strategies to enhance the experience of our student-athletes and the competitiveness of our athletic teams within the Patriot League. Working with a consultant, the committee has looked at comparative data, gathered input from all parts of the community, and drafted a statement that describes how athletics fits into our strategic direction and how we define success. The committee will continue to work throughout the summer and submit its final report in the fall. Thanks for your patience with this long update! I hope that you are as excited as I am about all that we have accomplished this year, and all that we can do together in the years to come. I am deeply grateful for your support. PS. 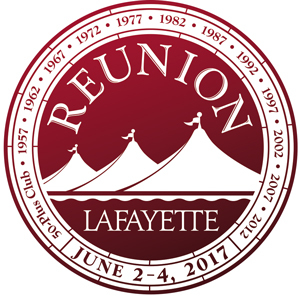 I look forward to seeing many of you at Reunion this weekend. I will discuss many of the topics in this update in my annual State of the College address at 10 a.m. Saturday, June 3, in the Marlo Room, Farinon College Center. If you cannot attend, you may watch via live stream on the web at this site.